(Newser) – A Canadian man recently freed with his American wife and children after years being held hostage in Afghanistan has been arrested and faces at least a dozen charges including sexual assault, his lawyer said Tuesday. 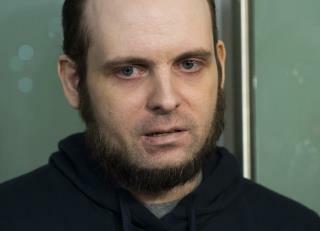 Attorney Eric Granger said Joshua Boyle also faces assault and forcible confinement charges, and was in custody, per the AP. Boyle, his wife Caitlan, and their three children were rescued last year in Pakistan, five years after the couple was abducted by a Taliban-linked militant group while on a backpacking trip in neighboring Afghanistan. The children were born in captivity. A court order bars reporting any information that could identify the alleged victims or witnesses in the case. The alleged offenses occurred in Ottawa last year. In a statement to the Toronto Star, Boyle's wife wrote, "I can't speak about the specific charges, but I can say that ultimately it is the strain and trauma he was forced to endure for so many years and the effects that that had on his mental state that is most culpable for this." She called for "compassion and forgiveness," adding, "As to the rest of us, myself and the children, we are healthy and holding up as well as well we can." Boyle told the AP in October that his wife had been hospitalized in Ottawa, but did not specify why she was taken to the hospital. The whole thing smacks of religious extremism , the man is unbalanced to have gone to Afghanistan in the first place. But often the case isn't it , when people have religious fervor and zealous to the extreme they will listen to no one because they are so much more clever than any other person. Called madness I thought ! I knew something was stinky about this whole thing when I first read it. He seems like a WEIRDO with a capital W! "The alleged offenses occurred in Ottawa last year. " Meaning, after Joshua Boyle and family returned to Canada, in 2017? The alleged victim was the wife, or someone else?